Hello! Sorry for the lack of posts this week. I’ve been busy busy busy with uni work as we had a deadline yesterday. 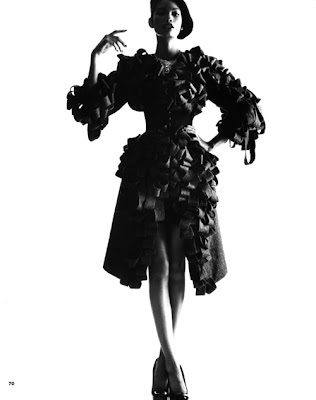 I may of told you that we had a group project to do based on a fashion house. We chose to look at Sonia Rykiel and we had to design a perfume campaign. Theses are our final images, that were a4 size, and would advertise a new perfume by Sonia Rykiel. 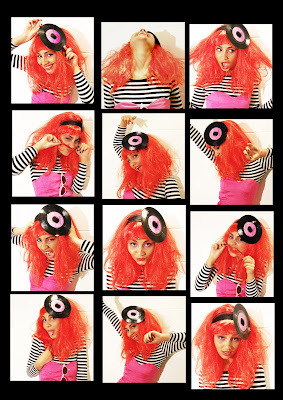 We wanted to focus on the fun side of Sonia and her recent s/s 2010 collection, with aspects of the 70s thrown in. 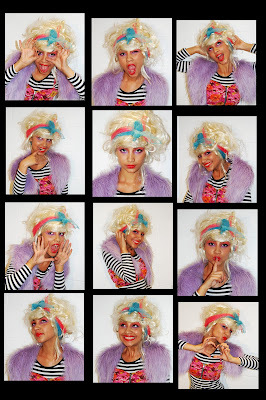 Our model Marsha was amazing and took to the different characters like a duck to water. Doesn’t she look good!? That’s all from me today. I’ll be back tomorrow with some gorgeous finds for my Three for Thursday post! Wow Pat looks amazing in those shots. Your project looks so good, definitely feeling the fun 70's vibe! finally i love the bows, very cute! Yayyyy the giveaway FINALLY arrived! I'm so relieved! Sorry about the missing items lol, it was all a bit of a crisis! But I'll find them asap and post them to you as soon as I do… I'm so unorganised! I love your sonia rykiel photos!